Abstract: New hard drives can bring on an overall increase in system performance, a gigantic leap in storage capability and more. Usually the installation of a new hard drive is something for a techno-savy person to handle, and not generally something everyone will want to do on their own. Typically the drive is dropped into an open bay, the jumpers are set to slave or master so that it doesn't conflict with another drive and the BIOS is told to go look for this new drive. Once the computer knows you have put in a new drive it's still up to you to partition the drive, and then format each of the partitions so that data can be stored. For someone not familiar with Fdisk, this can be hazardous, especially if there are other drives in the computer which might accidentally get their partitions deleted or whatever. 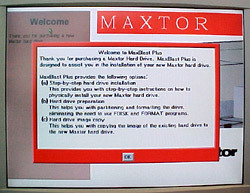 To alleviate all these concerns and in general to make the whole process of installing a new drive all that much more simple, Maxtor have developed a very useful program called MaxBlast. You can download MaxBlast here. 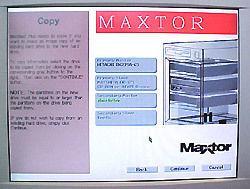 Basically what you do is insert a floppy with the program in the A:\ drive and restart the computer. So long as the BIOS is set to try and boot from the floppy you will be kicked into the program once the computer restarts. From there you will be sent through a bunch of screens which help the software figure out what you want it to do (make a copy of an existing drive, format and partition a new or existing drive, etc. 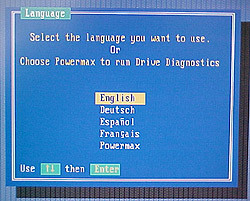 First choice is what language you would like the sofware to work in. The software guides you through step-by-step instructions on how to physically install the HDD if it isn't already. It will also allow you to quickly and easily partition and format the HDD. Finally, you have the option to copy an existing drive onto the new drive. At this point, the software gives you the option to make a drive image copy from an older, or existing HDD onto the newly installed HDD. For our drive, we only needed to partition and format the HDD. 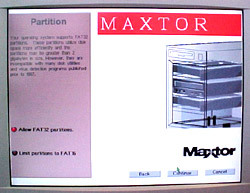 Rather than limiting the format to FAT16, we enabled FAT32 partitions. 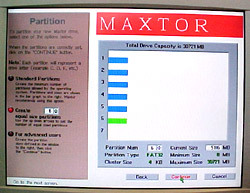 Through a small display, you can adjust the number of partitions you would like to have on the drive from 1 to whatever number you choose. 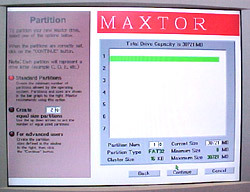 The software also gives the chance at this point to adjust the size of each partition. We decided upon six 5GB partitions, which showed up as 6 evenly sized bars in the display. Had we made one drive larger or smaller that would have been represented by the graphics. 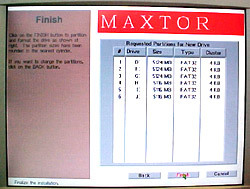 Once the drive has been fully partitioned and formatted the size, type, and drive information is displayed. The software is very simple to use, so it is difficult to make any mistakes when setting up a new hard drive.